Composition: This semi-sweet white wine is made from 100% Riesling. The soil is granitic and has southern exposure. Tasting Notes: This wine has a pale yellow color with intense notes of citrus fruit dominated by lime and balanced by an incredible freshness. After a light aeration, the minerality takes over. On the palate, there is more citrus fruit flavor and minerality. With bottle age, the wine will acquire a typical mineral nose reminiscent of gunflint. Pairing: This Riesling will be perfect with fish, or with the traditional “Choucroute” (sauerkraut and sausages). 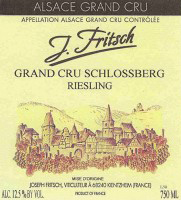 Vignerons from several generations, the J. Fritsch estate is located in Kientzheim, in the heart of Alsace. It is on this terrior of great geological diversity where they cultivate 40 different blocks of vines. Half of their vines are located in the prestigious terrior of Grand Cru Schlossberg, Furstentum and Lieu-dit ("place called") Altenberg. Out of respect for nature, J. Fritsch uses sustainable practices in vineyard management. The harvest is exclusively handpicked and the harvest dates are decided from grape samplings to ensure the peak of ripeness and thus the best quality wines. J. Fritsch is proud of their quality control throughout the entire management of the vineyards, from processing the grapes to ensuring the highest quality of wines they produce. One of the best properties in the appellation of Vacqueyras, and certainly the bestnamed, Le Sang des Cailloux is located on the limestone escarpment which divides the villages of Vacqueyras and Sarrians. The idiosyncrasy betrayed by Serge Férigoule handle-bar moustache reveals an approach to winemaking which is as individual as it is successful.